Green beans are generally difficult to get excited about mainly because of the “squeak” factor. When green beans are not quite cooked enough they squeak when you bite into them. It really sends a shiver up my spine and gives me goose pimples. However, (you knew there was going to be a however didn’t you!!) this dish is so delicious and doesn’t have a squeaky bean in sight. I have eaten this bean dish on many occasions since I was a little kid and always wondered how they can taste so good. The Greeks, Turkish and Lebanese all make a similar dish, I generally call it “collapsed beans” as they are cooked until they collapse. Several years ago I was discussing this dish with my Lebanese fruit and veg grocer who ran off to get his wife so that she could give me the recipe. What a legend. I have been making it ever since. They also gave me a pot of “Lebanese Pepper” which until recently I had no idea what was in it. I now have the recipe for that too…phew! The beans are a great side to meat, grilled fish, chicken or just served as the main part of a meal with some spicy rice with toasted almonds, pine nuts and cashews. 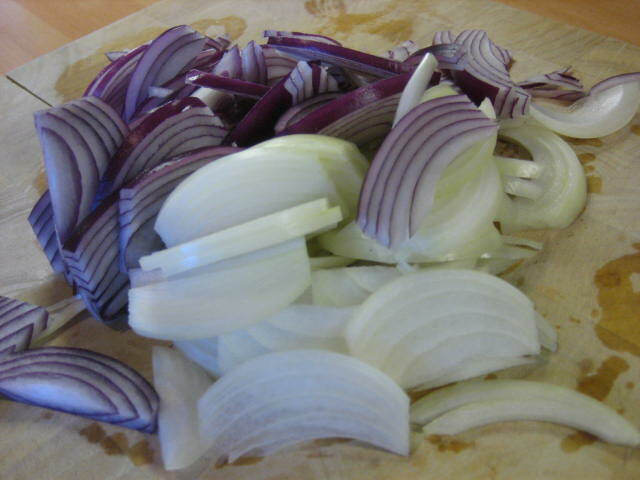 Peel and slice onions by cutting in half and slicing thin half moons. Add to a large heavy based pan with a good glug of oil. 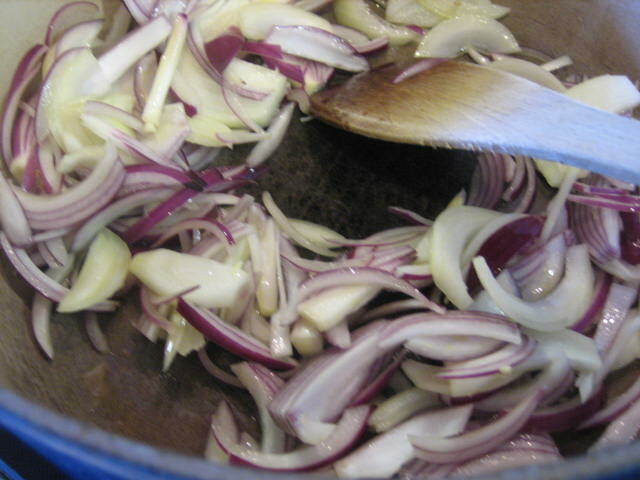 Fry onions on a medium heat until soft, sweet and translucent. Do not brown. 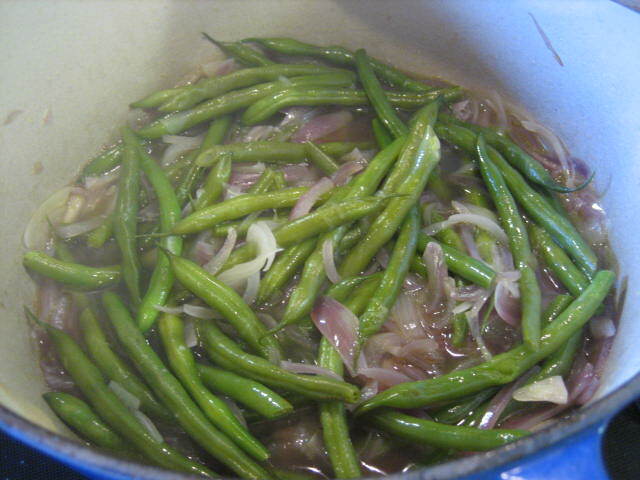 Add washed beans with tops/stalks removed (leave tails). Add to pot. Boil kettle. 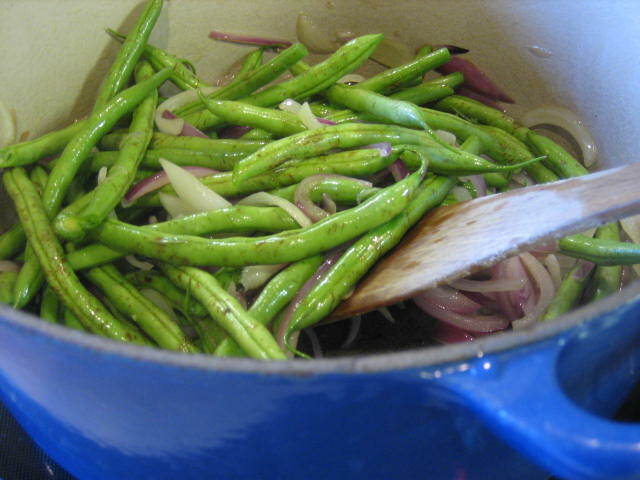 Once beans have turned a brilliant green colour add enough boiling water to cover the beans. Cook on medium heat until water has reduced by half. 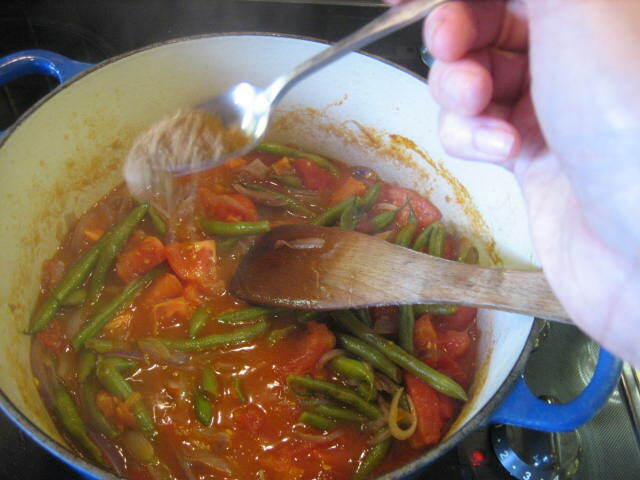 Add tinned tomatoes. 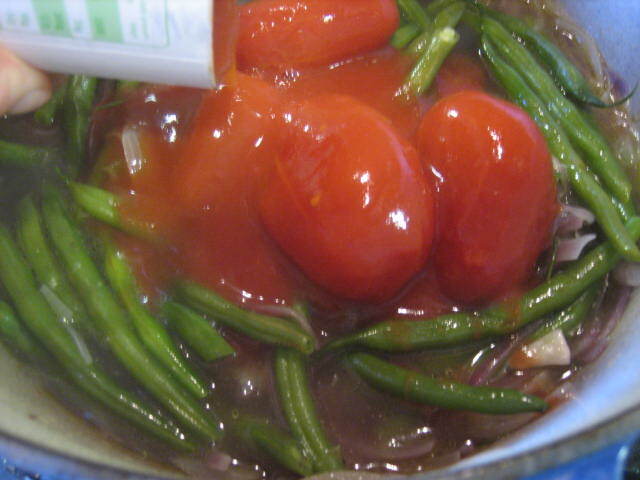 Continue to cook until tomatoes have broken down and beans are cooked through and collapsed. Add teaspoon of Lebanese peppers and season to taste. This dish reheats well and tastes even better the next day. This entry was posted on	August 19, 2010 at 8:17 pm	and is filed under Dinner, Lebanese, Lunch, Side dishes. Glad this recipe is finally on your website. This is such a delicious and healthy dish. I must try to cook it for myself soon! Might be nice with some grilled tuna, what do you think?